Due to ITAR restrictions, shipments are limited to the fifty (50) United States. Down Range Products, LLC will not ship to APOs, FPOs, or territories. Down Range Products, LLC reserves the right to cancel any order that is suspected of being shipped to a freight forwarding service as a means of exporting otherwise controlled articles covered by ITAR. 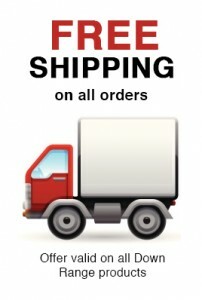 Down Range Products, LLC offers free shipping for orders. The shipping method provided is USPS First Class Mail with tracking. If a shipment is incomplete, it must be reported to Down Range Products, LLC within three (14) calendar days of the order being received as reported by the delivery service. With the exception of the following listed items, all purchases made from Down Range Products, LLC carry a seven (14) calendar day return period that starts the day of receipt of the order as reported by the delivery service. Within that time, a customer may return unused items. Buyer is responsible for shipping cost. Orders that qualified for free shipping will also have the actual shipping cost deducted from the refund amount.